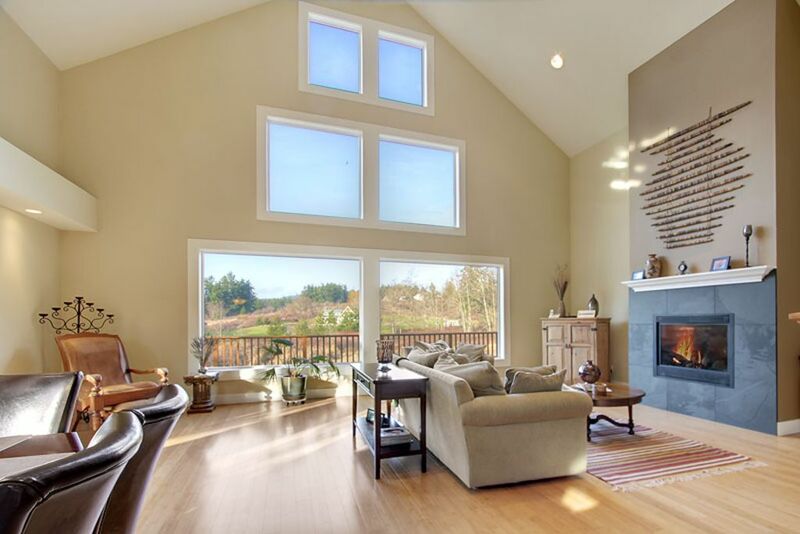 This private, luxurious San Juan Island home built in 2007 is set upon 5 acres and offers vaulted ceilings, bamboo floors and a great room that will take your breath away. The master bedroom brings the ultimate escape with a comfortable king bed, vaulted ceiling and fan, large walk-in closet, and you can indulge in the jetted bath or custom stone floor shower. Enjoy daytime views of the countryside or evenings in front of the slated, gas fireplace. A large, bright, open kitchen with modern, stainless steal appliances makes this home a perfect place for entertaining your friends and family. The large, wrap around deck draws you outdoors where you can BBQ and leisure in the sun. Take a short walk to our dock on Lake Margo (accessible in the dry season). Friday Harbor is about a 6 minute drive. This home is perfect for those wanting to escape the city to the quiet countryside of San Juan Island. Had an wonderful stay at this home! Immaculate home. Had everything we needed. Perfectly located. Would absolutely recommend and hope to stay there again in the future! This is a lovely, spacious, comfortable home with a nice area for children (and adults) to play. Our family reunion consisted of 5 adults and 3 children (4, 6 and 7) and the home was perfect with Lake Margo a short walk away and swimmable, a spacious lawn for soccer and bow and arrow practice and a wonderful tree for climbing. The home is very open (and has much foliage around to look at), light, comfortable, well built and located on a side road so quiet. It is also not far from Friday or Roche Harbors and it is easy to get to the different parks, e.g., Lime Kiln and Cave Point which are both very interesting. We were visiting over July 4th so went to the Friday Harbor parade which was much fun - lots of locals and visitors enjoyed this small town happening. The owners were very attentive to our need when the WiFi was not working (we were told that can happen a bit on the island) and came out and was able to get it going. This was a lovely place to stay and we all enjoyed it very much. Beautiful time in the Islands. My husband and I and another couple had a wonderful time in this house on San Juan Island. Plenty of room for 2 couples with a great kitchen and living space. I would come back again in the summer because of the huge deck and outdoor seating. Linens and towels were superior and my husband loved the king size bed in the master. The home is immaculate, sat in the sun on the decking out the back in nothing but peace and quiet was bliss. Rooms were all comfy to the highest level, bathrooms spot on, upstairs in particular is beautiful, location is ideal for the whole island with a car. Can not recommend this place enough! Very clean and private house! We loved it! It will be better to have another bathroom at 2nd floor. We stayed in this lovely home during a mini family reunion over Labor Day. The house was very clean and spacious. We enjoyed our walk to Lake Margo and the easy access to everything on the island. The resturants, sunshine and time together was great fun.